If there’s a more time-honored concept in marketing than the funnel, I don’t know what it is. There are more variations on the marketing funnel than virtually any other model as well. The marketing funnel is elegantly simple: illustrate the different stages that people go through to become customers. Most marketing funnels are based off the 1898 AIDA concept promoted by St. Elmo Lewis. Awareness, when someone becomes aware of your product or service. Interest, when someone becomes interested in learning more about your product or service. Desire, when someone wants to buy from you. Action, when someone buys something. Audience: the number of people you have access to that are potentially qualified to buy your stuff. For example, if you sell college textbooks, there won’t be that many folks under the age of 16 interested in your wares. Prospects: the number of people who identify themselves as being in the market sooner or later for your goods and services. For example, these are the people who follow you on Twitter and visit your web site from an organic search query. They are self-identifying as people who want to hear what you have to say. They’re shoppers, shopping for what you have to offer. Leads: the people who raise their hand and engage you to begin the purchase process. This might be something as casual as signing up for an email list or as dedicated as filling up a shopping cart (real or virtual) with stuff. Customers: the people who choose to give you their money in exchange for your goods and services. Evangelists: your unpaid marketing force that refers people to you and can’t stop talking about you in a positive way. By identifying the nouns, the people, in Lewis’ model, we have something to measure a little more objectively and cleanly. You can now take all of the data and analytics information you have access to and start putting it in buckets that you can measure. For example, you can use Google Ad Planner, Facebook ads, and social media monitoring tools to identify audience pools, then plug in Google Analytics traffic data for your prospects, the people who stopped by. Turn on goal and conversion tracking in Analytics and you can measure leads. Depending on your business model, you might even be able to track sales, but if not, your CRM will measure sales and customers. You’ll then head back to Analytics to measure your evangelists, as well as social media. Don’t throw Lewis’ model away, however! It still provides tremendous value. Something that Ken Savage, owner and head instructor of Winchendon Martial Arts, admonishes us frequently is that if part of a technique is failing, head back to the previous step and fix what you broke there, since mistakes tend to cascade. By keeping Lewis’ verbs in place, you know exactly what actions your audience are or are not taking, and can take appropriate steps to fix them. For example, if prospects are not becoming leads, they are not expressing interest in you. Why is that? 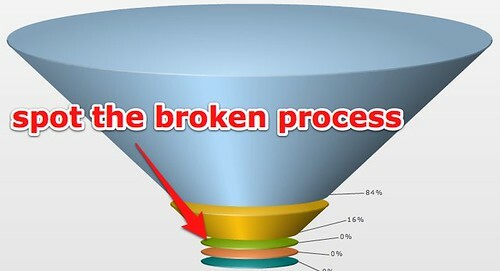 Is there a conversion mechanism on your site that’s broken? Is there an unclear or absent call to action? By keeping the verbs around, you can diagnose what actions aren’t happening and repair them quickly to get people moving through the funnel smoothly again. Draw that out, assign metrics and tools to each bucket, and you’ve got a marketing funnel that will work for your specific business.